Italian scholar of the fifteenth (?) century; author of a mystical commentary to the Song of Songs (Vatican MS. No. 230). De Rossi-Hamberger, Historisches Wörterbuch, p. 103. Italian senator; born at Milan 1833; died there Dec. 11, 1899. In youth he was an ardent patriot and a conspirator. In 1859 he was sent by Victor Emmanuel II. as commissioner to Garibaldi's camp. He was a pronounced skeptic. Elected deputy of Milan in 1867, he remained in office for several legislative periods. In 1890 he was made a senator. Fano is author of "Della Carità Preventiva e dell' Ordinamento delle Società di Mutuo Soccorso in Italia," Milan, 1868. Rabbi of Mantua and cabalist; lived in the sixteenth and seventeenth centuries. 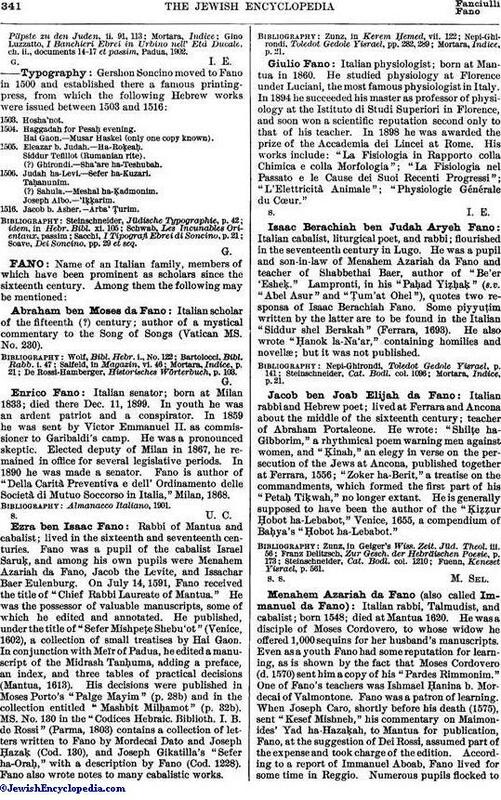 Fano was a pupil of the cabalist Israel Saruḳ, and among his own pupils were Menahem Azariah da Fano, Jacob the Levite, and Issachar Baer Eulenburg. On July 14, 1591, Fano received the title of "Chief Rabbi Laureate of Mantua." He was the possessor of valuable manuscripts, some of which he edited and annotated. He published, under the title of "Sefer Mishpeṭe Shebu'ot" (Venice, 1602), a collection of small treatises by Hai Gaon. In conjunction with Meïr of Padua, he edited a manuscript of the Midrash Tanḥuma, adding a preface, an index, and three tables of practical decisions (Mantua, 1613). His decisions were published in Moses Porto's "Palge Mayim" (p. 28b) and in the collection entitled "Mashbit Milḥamot" (p. 32b). MS. No. 130 in the "Codices Hebraic. Biblioth. I. B. de Rossi" (Parma, 1803) contains a collection of letters written to Fano by Mordecai Dato and Joseph Ḥazaḳ (Cod. 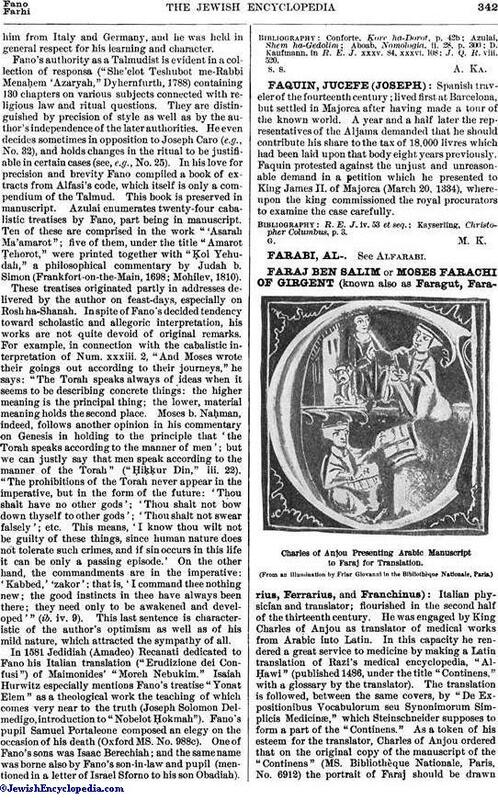 130), and Joseph Gikatilla's "Sefer ha-Oraḥ," with a description by Fano (Cod. 1228). Fano also wrote notes to many cabalistic works. Italian physiologist; born at Mantua in 1860. He studied physiology at Florence under Luciani, the most famous physiologist in Italy. In 1894 he succeeded his master as professor of physiology at the Istituto di Studi Superiori in Florence, and soon won a scientific reputation second only to that of his teacher. In 1898 he was awarded the prize of the Accademia dei Lincei at Rome. His works include: "La Fisiologia in Rapporto colla Chimica e colla Morfologia"; "La Fisiologia nel Passato e le Cause dei Suoi Recenti Progressi"; "L'Elettricità Animale"; "Physiologie Générale du Cœur." Italian cabalist, liturgical poet, and rabbi; flourished in the seventeenth century in Lugo. He was a pupil and son-in-law of Menahem Azariah da Fano and teacher of Shabbethai Baer, author of "Be'er 'Esheḳ." Lampronti, in his "Paḥad Yiaẓḥ" (s.v. "Abel Asur" and "Ṭum'at Ohel"), quotes two responsa of Isaac Berachiah Fano. Some piyyuṭim written by the latter are to be found in the Italian "Siddur shel Berakah" (Ferrara, 1693). He also wrote "Ḥanok la-Na'ar," containing homilies and novellæ; but it was not published. Italian rabbi and Hebrew poet; lived at Ferrara and Ancona about the middle of the sixteenth century; teacher of Abraham Portaleone. He wrote: "Shilṭe ha-Gibborim," a rhythmical poem warning men against women, and "Ḳinah," an elegy in verse on the persecution of the Jews at Ancona, published together at Ferrara, 1556; "Zoker ha-Berit," a treatise on the commandments, which formed the first part of his "Petaḥ Tiḳwah," no longer extant. He is generally supposed to have been the author of the "Ḳiẓẓur Ḥobot ha-Lebabot," Venice, 1655, a compendium of Baḥya's "Ḥobot ha-Lebabot." Fuenn, Keneset Yisrael, p. 561. Italian rabbi, Talmudist, and cabalist; born 1548; died at Mantua 1620. He was a disciple of Moses Cordovero, to whose widow he offered 1,000 sequins for her husband's manuscripts. Even as a youth Fano had some reputation for learning, as is shown by the fact that Moses Cordovero (d. 1570) sent him a copy of his "Pardes Rimmonim." One of Fano's teachers was Ishmael Ḥanina b. Mordecai of Valmontone. Fano was a patron of learning. When Joseph Caro, shortly before his death (1575), sent "Kesef Mishneh," his commentary on Maimonides' Yad ha-Ḥazaḳah, to Mantua for publication, Fano, at the suggestion of Dei Rossi, assumed part of the expense and took charge of the edition. According to a report of Immanuel Aboab, Fano lived for some time in Reggio. Numerous pupils flocked tohim from Italy and Germany, and he was held in general respect for his learning and character. Fano's authority as a Talmudist is evident in a collection of responsa ("She'elot Teshubot me-Rabbi Menaḥem 'Azaryah," Dyhernfurth, 1788) containing 130 chapters on various subjects connected with religious law and ritual questions. They are distinguished by precision of style as well as by the author's independence of the later authorities. He even decides sometimes in opposition to Joseph Caro (e.g., No. 32), and holds changes in the ritual to be justifiable in certain cases (see, e.g., No. 25). In his love for precision and brevity Fano compiled a book of extracts from Alfasi's code, which itself is only a compendium of the Talmud. This book is preserved in manuscript. Azulai enumerates twenty-four cabalistic treatises by Fano, part being in manuscript. Ten of these are comprised in the work "'Asarah Ma'amarot"; five of them, under the title "Amarot Ṭehorot," were printed together with "Ḳol Yehudah," a philosophical commentary by Judah b. Simon (Frankfort-on-the-Main, 1698; Mohilev, 1810). These treatises originated partly in addresses delivered by the author on feast-days, especially on Rosh ha-Shanah. In spite of Fano's decided tendency toward scholastic and allegoric interpretation, his works are not quite devoid of original remarks. For example, in connection with the cabalistic interpretation of Num. xxxiii. 2, "And Moses wrote their goings out according to their journeys," he says: "The Torah speaks always of ideas when it seems to be describing concrete things: the higher meaning is the principal thing; the lower, material meaning holds the second place. Moses b. Naḥman, indeed, follows another opinion in his commentary on Genesis in holding to the principle that 'the Torah speaks according to the manner of men'; but we can justly say that men speak according to the manner of the Torah" ("Ḥiḳḳur Din," iii. 22). "The prohibitions of the Torah never appear in the imperative, but in the form of the future: 'Thou shalt have no other gods'; 'Thou shalt not bow down thyself to other gods'; 'Thou shalt not swear falsely'; etc. This means, 'I know thou wilt not be guilty of these things, since human nature does not tolerate such crimes, and if sin occurs in this life it can be only a passing episode.' On the other hand, the commandments are in the imperative: 'Kabbed,' 'zakor'; that is, 'I command thee nothing new; the good instincts in thee have always been there; they need only to be awakened and developed'" (ib. iv. 9). This last sentence is characteristic of the author's optimism as well as of his mild nature, which attracted the sympathy of all. In 1581 Jedidiah (Amadeo) Recanati dedicated to Fano his Italian translation ("Erudizione dei Confusi") of Maimonides' "Moreh Nebukim." Isaiah Hurwitz especially mentions Fano's treatise "Yonat Elem" as a theological work the teaching of which comes very near to the truth (Joseph Solomon Delmedigo, introduction to "Nobelot Ḥokmah"). Fano's pupil Samuel Portaleone composed an elegy on the occasion of his death (Oxford MS. No. 988c). One of Fano's sons was Isaac Berechiah; and the same name was borne also by Fano's son-in-law and pupil (mentioned in a letter of Israel Sforno to his son Obadiah). J. Q. R. viii. 520.